Ever since Angus graduated from K9 Central’s trick class when he was 7 months old, both Kim and Angus have been hooked on tricks. Kim has trained Angus to perform over 80 different tricks and behaviours and they are still going! Angus loves performing anything from cute parlor-type tricks such as take a bow, to more advanced show-type tricks such as his going on a trip trick (opening a suitcase and laying down to hide in it). But they’ve also discovered that tricks such as leg weave, figure 8, back stall and scoot come in handy for their disc routines. Under the guidance of Morgan Jarvis, Angus and Kim are starting to make their way into the world of disc dog. In their very first freestyle competition, this dynamic team placed 3rd. Kim is working on her long throws, with her goal of coming close to a 200 ft. throw by spring 2013. Currently Kim and Angus’ longest recorded catch has been 147.4 feet. Kim has attended a disc throwing clinic with current world record holder Rob Mcleod. Kim and Angus also enjoy competing in dock diving. They attended the dock diving nationals in May 2012, where they received their senior jumper title. Angus achieved his best recorded jump at 20.9 feet. 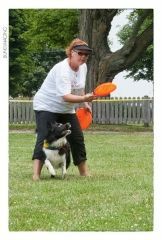 Kim and Angus also train and enjoy agility, flyball and herding. Trick training is Kim and Angus’ fun way of building the special bond that they have. Constantly learning new, challenging behaviours is fantastic for building Angus’ vocabulary, having him think “outside the box” and breaking a mental sweat. Come out to Kim’s tricks class. Angus would love to meet you and your best friend. Let’s have some fun together!